In Fire Shifts, use the table below to easily find your city’s defaults. Click here if table is not visible. The department I work for has two types of schedules that we run together. We have two employees working 24/48’s (schedule type 2 on the app), and then another two employees work the 24 on/24off /24on /72off (Schedule type 14 on the app). Would it be possible to upgrade the app to be able to select the schedule type for each shift number? This would enable me to set up the entire departments schedules with the app. Like Calender, only problem I have is, there should be a way to change the background color. I use black as a shift color and it looks all combined with background color. And would it be possible to mark today in a way? 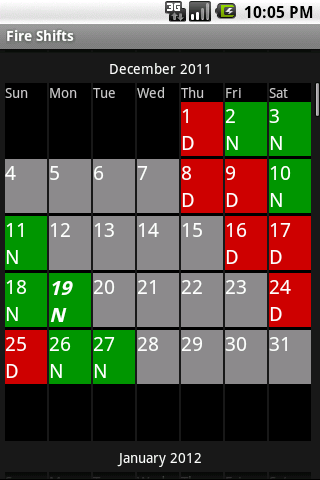 the calender sync is inaccurate.I entered info on google and dates sync to different day.would not completely rely on added events.not bad for quick view of shifts which can be done with free version. Which phone do you have? I haven’t heard of this problem before and would like to get it fixed as soon as possible. I have this problem on the HTC one x, the calendar syncs a day late. Hi, I also have this problem, although I suspect that being in different timezone to the US may have something to do with it? Any way that timezones could be added to compensate? Otherwise great app. problem must be with phone this app works great once you find the right shift your on. I work as a firefighter in england and this calendar can be applied to suit any shift pattern here. Thanks so much for making my life easier!! Try shift number 48. I do same with wed as kelly. I had to set offset up by 13 days to set the weeks right. But if is opposit for you try offset of 5. Hi, great app but please could you add an AABBCCDDDD shift pattern. Thanks, Rich. Could you update it so i can see the entire next calander year. I work sun,wed,sat,mon,thurs,tues,fri. That is our rotation every 3 weeks. Its a forward slash. Can you make this available? Thank you. Which number is for the shift 24 on/ 24 off/24 on/ 24off/ 24 on/ 96 off? This should be Shift type #5 or #6. If you email a picture of your schedule to monica@fireshifts.com, I can help you with the offsets. If you can send a pic of your schedule, we can try to add your shift type to Fire Shifts and Fire Shifts-Pro. I can not find where debit/kelly days are added. Also, there was never an option to uninstall in order to recieve refund? Fire Shifts-Pro syncs with your Google Calendar, so you enter your Kelly days on your Google Calendar, and the symbols appear on the Fire Shifts-Pro app calendar. Here is tutorial, that can walk you through it. Let us know if it still isn’t working for you. We work with ABC shifts. We work a 24 every other day for 4 shifts. Then 4 days off. Then we work every other day for 4 more shifts and have 6 days off. Kind of a 24 day rotation. I can’t find anything like that on your list. That schedule is for the Ogden Fire Dept in Ogden Utah. It sounds as if you have shift type #18 (4’s and 6’s). If you email your personal schedule for the month of December to monica@fireshifts.com, or send a pic, I can help you with the offsets. I work the same schedule as described in Chula Vista, Ca. 3 shifts (A,B,C) 24 on, 24 off for 4 shifts, 4 days off. Another cycle and 6 days off. Maybe Im clueless and missed it..But is there any way to set up a 4 on 2 off (8hr shifts) rotation? Can you make a schedule to do 10/14’s?. 2 10hr days followed by 2 14hr nights, then 4 off. I am a LEO and work 12’s. 2 on 2 off 3 on 2 off 2 on 3 off beginning on a Monday it is 2 week rotation. I have my schedule as #26 (mecklandburg) with a 7 day offset. My question to you is, is there a way I could customization the schedule to show a bi weekly payday? (Ie; every other Friday). Is it possible for you to customization the app so that someone could input a 1 or 2 or 3 week schedule and give the app the ability to just duplication the pattern for the rest of the calendar year? Just a thought. Thanks again. Great app. If you upgrade to Fire Shifts-Pro, you can program a bi-weekly payday using your Google Calendar. We’ve added an option to sync with a Holiday calendar on the Fire Shifts-Pro version. For instructions, go to the “About” page and scroll down beneath the 2 tutorials. I work a set schedule. Sunday Tuesday Thursday. Is there a way to get it to set up like that? We should be able to add that to our next update. What department/city/state is this shift for? I am also looking for a 4 on 2 off rotation. For example 4 A’s, 2 days off, 4 B’s, 2 days off, 4 C’s, 2 days off and so on. Is this possibly available on the pro version? Also, any way to add overtime? Thanks. We updated our web list to show Los Angeles County with an offset of 2. I work Mon thru Thursday 6a to 6p off Fri thru Sun set schedule. Try Shift Type #66 (4 on, 3 off). Los angles Co Fd, #11 and 2 is way off, does not match my shift calendar not even close. If you change the offset to 6 days, it should line up again. Thanks for letting us know it was listed incorrectly. The list has been updated. We should be able to add another variation of the 4/6 schedule in our next update. Useful app. Does Fire Shifts Pro allow me to label my 10/14 (2 days, 2 nights, 4 off) shifts D C B A instead of A B C D, or is there any easy fix for Fire Shifts Free. I purchased fire shift pro cause it said it was completely customizable. That is completely false. I work a shift that is not even in the list and there is nothing I can do about it. “Pro version of Fire Shifts, a customizable Fire and EMS Shift Calendar. Sync with Google Calendar. A customizable Fire and EMS Shift Calendar. We also continue to add different shift types to Fire Shifts and Fire Shifts-Pro. If you would like to email us your schedule, we’d be happy to try to add your shift type for you in our next update. I was wondering if you had a schedule that follows this pattern, 24 on, 24off, 24 on, 72 off? Just a request…any chance of adding a task/to do component to this calender? I work a 12hr -4 on and 4 off schedule with 2 days on days and 2 on nights from 6a -6p then from 6p-6a. At Clearwater paper in Shelby, N.C. can use work this into ur app if possible. Thanks. You should be able to use Shift Type #47. It’s 2 days on/2 nights on, 4 off. Is there any way you can split the days in halve so can set for days and nights?? We work 2days 2nights 4off but be good to see what shift is on other days. I am looking for a 4 on (days) 2 off then 4 on (aftrrnoons) 2 off. 8 hour shifts. Days and afternoons only. Thanks! Pingback: Fire Shifts – Pro – Free APK Download | Appdroid Blog. I’m guessing you could save adding shifts to the list if you allow for any letter in the settings rather than just “A” for the 1st shift, “B” for the 2nd etc. I could use one of the other departments 24hr shift except we don’t use the same letters. I couldn’t find the schedule for the Honolulu Fire Department listed but through others comments and some lucky guesses here it is. #6 with Offset of 3 days. Love this app, makes life easier. Having problems changing the start day of my 2 day 2 night 4 off shift. Maybe it’s me doing something wrong!!! You can use shift #20 AABBCCDD and program D with a blank label and different color. Thanks for that Monica.. Excellent! I work a 3 week rotation of sun wed sat, Mon Thurs, Tues Fri. Our 4 days fall on the weekend. Is there a schedule on here that I am missing or can you make one? I like the looks of the app if I can make it work my situation. Can you email your full rotation to kevin@fireshifts.com? I’m not sure if we have that shift, but I can add it to our next update. Hi Dimitris, you should be able to use Shift Type #2 (ABC), 24 on 48 off. Hi , some help please, can you tell me what shift number would cover the following shift pattern. 5 on 2 off, Monday to Friday , Saturday Sunday off. Earlies , nights, lates . Hi, thanks for that. I’m trying to work it out, I think I’m the reason you shouldn’t let old people have modern gadgets !! I work in Lincoln Nebraska, we work 24on 24off for 13 days(7 shifts with A B & C shifts) then we are off 8. We always start on Wed and end on Monday if that makes any difference. If a version of this schedule is available let me know. Hi, have gone pro to see if it gives me any more options? Hi Monica, is it possible to modify number 62 to add a third week ? We do early (6 till 2) .nights (10 till 6) and lates (2 till 10). I work in Lincoln Nebraska,we work 24on 24off for 13 days(7 shifts with A B & C shifts) then we are off 8. We always start on Wed and end on Monday if that makes any difference. If a version of this schedule is available let me know. Can you make a version of this for me? Could you add the schedule ABCC for the fire department of Antwerp, Belgium? it’s a 12 hour shift, day, night en 2 off. I work a modified 48/72. 48 on 72 off 48 on 72 off 48 on 48 off. Is there a schedule on here that would work. It is also a set kelly. Would be great if you could add personnel to the shift that they work. I have a lot of friends and family that use the same shift schedule but can never remember when there working. bom dia, onde trabalho, no Brazil, Brasilia, temos a escala (12×24 12/72) como faço para configura-lá? não percebi uma opção no programa. obrigado. I know I can go to Google calendar and put in vacation days etc and it I will be on fire shift calendar. Is there a way to have vis a versa so my shift would show on Google calendar? Could you add the schedule for Bergen fire department, Norway. We work a 4 week schedule. 24 hours at weekdays and 48 hours at weekends. I work in Omaha, Ne. We work a 24 on 24 off for 5 shifts with 6 off. #38 gets me close but moving the offset will get one shift right with the other 2 flip flopped. I work for the Jefferson Parish Fire Dept(local 1374) . we work your schedule, I set the type to 102 with a six day offset and worked great for me. Hi there. We have a four watch system, I.e. AA,BB,CC,DD. Do you have that so I could load it? Many thanks. It just starts again after. Are you able to do up a roster for 24hours on __ 24hours off___ 24hours on then 5 days or 120 hours off this is for a Sydney Australia workplace. I hope you can help. Sou do Corpo de Bombeiros do Estado de São Paulo e o Fireshifts caiu como uma luva. Sou do Corpo de Bombeiros do Estado de São Paulo – Brasil. E o Fireshifts Caiu Como Uma luva. We will be starting a 48 on 48 off work schedule with a 3 day RDO every 2 weeks. The RDO is split. One bi-weekly period I have a Sun RDO an next bi-weekly RDO would be a Mon. If I send you an example of out calender could you try to make it? Maybe I overlooked it but looking for a 24 every 6th day schedule. Can you help me out? Hi, I can’t change the colours on my iPhone for schedule # 37, but I was able to on my android. Any reasons why?? I agree having trouble on my iPhone changing colors. Can you make the calendar keep the previous month. It is difficult to reconcile when the previous month information disappears. Hi, lost phone which had fire shifts pro, do I need to pay again for new phone? Number 67, offset 5 is the best without actually E and F letters. I hope he makes a schedule to match. Need to put Omaha fire department, Omaha NE. My app does not allow me to change colour and label. It says ‘more options coming soon’. I need this fixed or it is useless for me. A calendar sync option, or possibly the ability to remove a day if needed for a Kelly day would be great. Hi looking for a 2 days 2 nights 5 off roster. I work 2days 2nights and 4 off. With 18 days leave over a 10 week cycle can you organise a calender to fit this duty system. There is 5 watches working this way. I use shift type #2, but how do i organize my calendar in the app? Hi I had FireShifts on my Droid and love it!! We just switched to IPhone and it doesn’t give me all the options, I only have schedule type and offset. There is no where for me to choose start day of week or to input the shift settings. Does anyone else have the same issue if you did how did you correct it? Could the app be upgraded to add EDO and Holiday days we have to schedule each year so that we can just look at the app and see when we our next shift day is off? It would be a big help if it was interactive. I didn’t find my schedule. I work 12/24 e 12/72. how I can add this schedule? When will the shift colors on iOS be changed? per week in Turkey, starting from Monday. I change this setting on iOS. The Android operating system seemed to have 24/48 or 24/72 shifts. On iOS, only letters ABC and so on appear. I am very happy if you can make these edits for iOS. Which phone are you using? iPhone or Android? My calendar is on the year 2020 also. My calendar is stuck on 2020. I’m on it. Uploading to the iTunes store now. I heard someone say that the iOS update fixed the issue if you can’t wait until it is updated in the App Store. Is there a way to share my calendar? I would love to be able to mark my vacation days on the calendar. Does anyone know of a way to do this? Right now, that is only available on FireShifts Pro on Android. Have used your calendar for years works great. Hi, I’m using IOS version.. is it possible to change the colour for the shift like the android version..
I’m able to use schedule type “26 – Mecklenburg EMS,” but I also rotate from day shift to night shift every 56 days. Is there any way to adjust preferences to show the days / nights switch, other than just marking it as an event in Google Calendar? I would prefer to have days / nights shown in a different color. I work for proctor & gamble, we work 2-2-3 rapid rotating shift with 4 teams on a 28 day cycle, is there a schedule for that? What’s the easiest way to set up for a 2-2-4 shift pattern? 4 shifts as the South Yorkshire Fire and Rescue UK shift.